Posted by Matt Shaffer BSN, RN, PHN | Aug 15, 2013 | Nutrition, On A Personal Note, What's in my food? Most people have probably heard of the term called a food diary. I would imagine some of you might have kept one at some point in time but my theory is that most of you have probably never kept a food diary before. Generally speaking, a food log or food journal or whatever you want to call it, is pretty much just like it sounds: it’s a log of food consumed over the span of several days. For simplicity reasons, most dietitians or health care providers will ask people to keep a food diary for about three days or so. Those three days will usually include a weekend day because that’s when most people end up splurging. However, the longer you do a food diary the more accurate it will be. I like to aim for five days or so with a weekend day included in that time span. I like to keep in tune with my body. This includes blood tests and also keeping track of my body fat percentage. At my last body fat measuring I learned that my body fat had increased from 14% to 16%. One reason for this could be that I’ve been in a strength training phase for the past several weeks where my workouts have focused more on adding strength as opposed to endurance. Either way, it’s important to take a step back and take a look and see where diet fits in. Without a proper diet one can hit plateaus with strength or athletic goals if there isn’t a proper balance of proteins to carbohydrates to fats. The most simplistic way for me to keep a food diary is with the help of my iPhone. I’ll simply make a note of what I ate throughout the day then go back and add them in via a free online website later. Fit Day is the site that I love to use. First of all, it’s free (and that’s always a huge plus). What I also love about it is that for being a free food diary site, the interface is extremely easy to use and gives you a breakdown of all the macro-nutrients that you’re taking in (as well as micro-nutrients if you want to be that specific). The site has a good list of foods that are already in its system but the site also allows you to easily add in your own foods through a custom form. That feature is something I absolutely love. When keeping a food log it’s important to be as accurate as possible and I definitely take advantage of that feature. What I also love about the site is that you can also put in target weight goals. Now, my weight goal is probably different than the majority of the population because my target weight is 185 pounds and I currently weigh around 177 pounds. Using calculations, the site will tell you the simple number of calories you need just to survive – that number for me just happens to be over 1800 calories. So that means if all I did was sit around and watch football for a day, I’d burn around that many calories. Of course, depending on the body fat composition of a person and other factors, that number may be higher or lower – but it’s a good general number to know. Another thing I love is that the site will also tell me how many calories I burn doing my job and how many calories I burn while working out. As a general rule of thumb, it’s better to underestimate the number of calories you spend in a day (calories are actually quite hard to burn) and over estimate the number of calories you eat in a day. Anyway, for me to obtain my target weight of 185, I need to take in somewhere in excess of 3200 calories a day. Quite a challenge isn’t it? So what does my food diary look like? Let’s take a look and see what I can learn about my dietary habits. A few things to note here: my intake of carbohydrates is pretty low for my activity level. Why am I eating so much protein!? The last thing to note, I’m under my calorie goals compared to my weight goals. I am way under my target calories for the day! 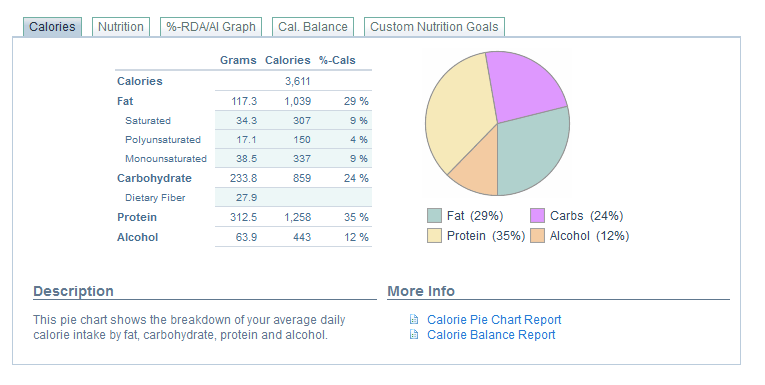 Also, almost half of my total calories are from protein. Not good! Who needs 266 grams of protein!? So, this is probably the day I’m the happiest about – I’m actually over my calorie goal. However, why am I eating over 300 grams of protein!? That is WAY too much! Do you notice the trend here? Too little calories and too much protein, again! So What Did I Learn From My Food Journal? Alright, as you can see, there are some major benefits to keeping a food diary for a few days. Just from tracking a few days it’s easy to get a good idea of where you stand in terms of taking control of your goals through nutrition. For example, when I thought I was getting enough total calories, I actually wasn’t. What I also didn’t realize is how much protein I was getting. I thought that I wasn’t getting enough protein in my diet from regular foods so I was supplementing it with extra protein in the form of powders. Obviously, I need to scale that back a little bit. Excess protein can be hard on the kidneys. I was also able to see that for all I’m eating I was getting nowhere close to what I need when it comes to fiber intake. Fiber is essential for gut health and colon cancer prevention. One mistake I made is that I wasn’t also tracking my fitness and activity levels along with my calorie intake. In my head I knew what I was doing in terms of exercise but looking back I actually have no remembrance. Next time I’ll log activity levels also. I also realize that I wasn’t logging my water intake which is important to realize – especially when consuming so much protein. Well, there’s the obvious – less protein and increase fats and carbohydrates as appropriate. 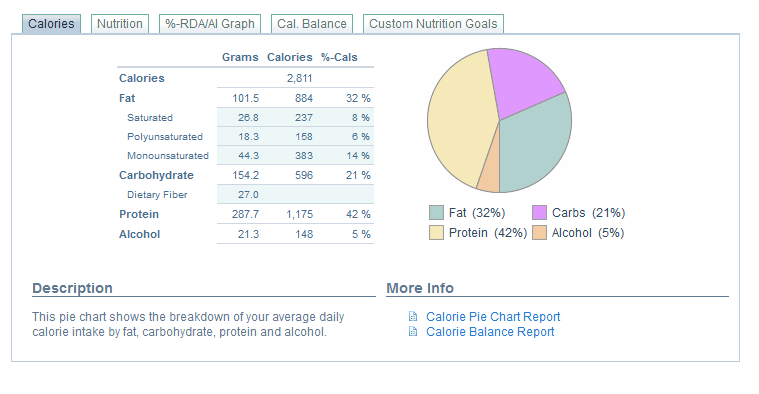 On a day that I’m active, 17% of my caloric intake from carbohydrates is just NOT going to cut it. Now, the next step of a food diary is tracking those changes I make so I have an idea of what to do right for my goals. What I would like to focus on now, is increasing my caloric intake while getting a healthier amount of protein, and increasing my fiber, and healthy fats and carbohydrate levels. We’ll see how the next food log stacks up! If you have any questions on keeping a food diary in conjunction with your own goals, let us know! What have you learned from a food diary that you have kept?